Road Racing: Peter Hickman confirmed, but who is going where in 2019? Peter Hickman will again ride for the Smiths Racing team in 2019. Confirmation of Peter Hickman’s decision to remain with the Smiths Racing team to ride the BMW S1000RR has seen a major piece of the international road racing jigsaw fall into place for 2019. Hickman is the man of the moment, winning races this year at the North West 200, Isle of Man TT, Ulster Grand Prix and Macau Grand Prix. He also set a new world road racing lap record at over 135mph on his way to victory in the Senior TT in June. Dean Harrison has opted to stay with the Silicone Engineering Racing Kawasaki team. The Louth man will be aiming to build on his success next season and the familiarity of the Smiths Racing team and the S1000RR will be a significant plus. Bradford’s Dean Harrison has also opted to stay put with the Silicone Engineering Kawasaki team. Harrison moved up a level this year and was in contention for victory in the Superbike TT until he was forced out with a clutch issue after he had lapped at over 134mph to open a healthy advantage. Harrison has been making eye-catching progress at the British Superbike rounds, which has clearly benefitted the English rider at the international road races. He narrowly missed out on victory in a pulsating Senior TT on the final lap to Hickman and will again be one of the key contenders for the big prizes in 2019. Manx rider Conor Cummins will remain with the Padgetts Honda team after a solid season, although a question mark remains over the fitness of popular New Zealand rider Bruce Anstey, who missed out this year as he battled cancer. Michael Dunlop increased his haul of Isle of Man TT wins to 18 this year with a treble on the Isle of Man. However, the Flying Kiwi joined Cummins on stage at Motorcycle Live at the NEC as Clive Padgett's roads line-up was officially unveiled on Sunday. Michael Dunlop has not raced, understandably, since the tragic death of his brother William in a crash in practice at the Skerries 100 in July. The Ballymoney man rode for the Tyco BMW team this year, winning the Superbike TT, and also sealed wins in the first Supersport race on his MD Racing Honda and the Lightweight race on the Paton. Dunlop, who has now won 18 TT races, has been keeping a low profile and it remains to be seen if he will be back on the grid next year. Fermanagh’s Lee Johnston joined Ian Hutchinson at Honda Racing this season but it seems as though the North West 200 and Ulster Grand Prix winner could return to former backer Phil Reed at East Coast Racing next year. Hutchinson will also be hoping to put a frustrating 2018 behind him after struggling with injury, with the Yorkshire rider vowing to regain full fitness and return at his best in 2019. John McGuinness will have designs on returning to the sharp end after making his racing return at the Classic TT in August. The 23-time TT winner will ride for Norton at the TT after signing for Stuart Garner’s team this year. Roads sensation Davey Todd, who made a huge impression during his first full season between the hedges, is in hot demand. Todd rode for John Burrows’ Dungannon-based team in 2018 but will move to new pastures next season. The young prospect has a number of attractive offers on the table but has yet to make a decision on his preferred choice. 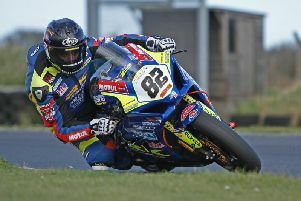 Derek Sheils will lead the charge for the Burrows Engineering Racing team on the latest-spec Suzuki GSX-R1000, with former Manx Grand Prix winner Tom Weeden also joining the ranks. Ulsterman Adam McLean will again compete for the Cookstown-based McAdoo Racing team and is a rising talent with a bright future ahead of him. Magherafelt's Paul Jordan enjoyed a strong finish to the season and has certainly staked his claim for a full-time ride with the Dafabet Devitt Kawasaki team next year.